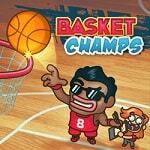 you Wish to become the basketball champion in game Basket Champs? Then choose one of the offered list of commands and enter game! For a victory it is enough to adjust a correct trajectory of flight of a ball and to throw them in a ring.